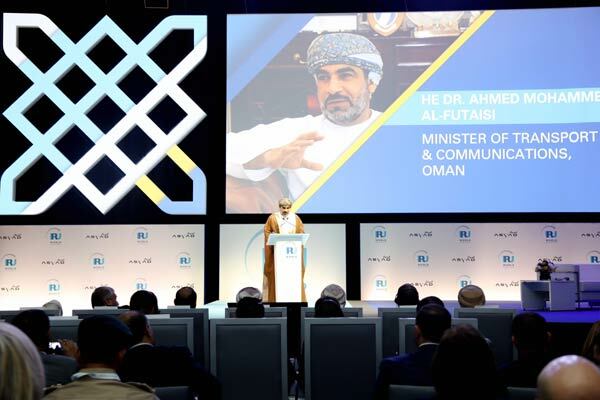 Leading global transport industry experts from over 75 countries besides 25 ministerial delegations and 10 international organisations are at the World Road Transport Organisation (IRU) Congress in Muscat, Oman to map out the future of road transport sector. Organised by IRU and co-hosted by ASYAD in collaboration with the Ministry of Transport and Communications, the event was officially inaugurated by Sayyid Asa’ad bin Tariq Al Said, Deputy Prime Minister for International Relations and Cooperation Affairs and Personal Representative of Sultan Qaboos, today (November 7). Over the next two days, more than 1,000 delegates from 5 continents will be driving debate on trade and innovation, in the region and beyond at the Oman Convention & Exhibition Centre. Themed “Innovation on the Move”, this year’s congress explores to the role of technological advancements in optimising operations management, driving continuous improvement and facilitating global trade. “The faster we adopt disruptive technologies, the better chance we have to stay competitive and serve our customers better,” said Nabil Salim Al Bimani, Group Chief of Ports & Freezone and member of the organising committee. “Technology-driven innovation will be the key to meeting the challenges of tomorrow,” he stated. A declaration was signed between IRU, the guardian of the TIR system under the United Nations mandate, Mwasalat, the official TIR issuing authority, and the Royal Oman Police Directorate General of Customs. This reaffirms the sultanate’s commitment to boosting trade across its borders and working in partnership to bring the globally applicable international customs transit and guarantee system to life in Oman. In the first opening plenary session, “Moving in the 21st Century – Road Transport, Mobility and Trade” José Manuel Durão Barroso, Chairman of Goldman Sachs International and Former President of the European Commission, urged the industry to work together to effect positive change. “It is essential to talk, regardless of differing interests and animosities, because talking is what leads to deals, which in turn means trade and global prosperity,” he noted. Futurist and innovation expert Jim Carroll shared extensive knowledge and insights into the cutting-edge trends of our time to assist businesses and governments to pursue fast-paced innovation, and navigate rapid business model disruption and change. “In a time of rapid change, you can't expect to get by on what has worked in the past. You must be willing to do things differently. Abandon routine – embrace velocity!,” he added. The opening day's interactive roundtable sessions brought into spotlight a number of hot topics including data management and analysis, enhancing competitiveness with infrastructure development and new intermodal connections, designing the future workforce, adopting next generation platforms, enabling trade facilitation and increasing fuel efficiencies. On decarbonising transport, Benny Smets, CEO of the Belgian transport company Ninatrans, said: "Alternative fuels are the future for road transport, but only if they are easy to access! We have to leave the chicken and egg dilemma. Sustainable transport can be achieved if the whole logistics chain participates. Operators want to invest in vehicles on alternative fuel only if the Total Cost of Ownership is known and economically feasible."